Information in this section compiled by Ian Lester. 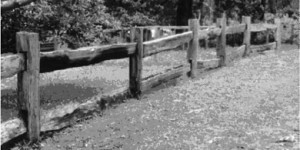 The fences described in this section were very important and they were easily made out of the timber so readily available to the pioneers of this region in particular. Useful for marking boundaries and controlling a handful of farm animals using what was available. Some early fences were simply a high roughly-stacked row of tree branches. These were quick and easy to build as materials were readily available but had the disadvantage of taking up too much land and thus reducing the area of pasture available. Another form of fencing was the dogleg fence which used spars similar to the chock and log fence but had no chocks. The logs were stacked on one another in a shallow zigzag. Very substantial, but what do the pigs have to say? A more formal variation was the chock and log method. This style was built by using short logs (chocks) approximately 3 feet (900cm) long and 1 foot(30cm) in diameter and long logs (spars) about 8 inches (20 cm) in diameter and 12 feet (3.5 metres) long. A row of chocks was placed on the ground approximately 10 feet (3 metres) apart and at 90 degrees to the line of the fence. The spars (logs) were then placed on top of the chocks. Another row of chocks followed then a row of spars (logs). A fence 3 chocks and spars high was usual though more could be used if necessary. The main problem with this method was that large animals particularly pigs with their strong necks could easily dislodge the rails and demolish the fence. Chock and log fence at Coal Creek Heritage Village, Korumburra, 2004. An advanced and popular fencing technique, requiring a lot of effort to build. The most popular type of fence was the post and rail fence which used split posts and wooden rails. Much preparation work was needed prior to building. Logs were cut to length 6 feet (1.8metres) for the posts and 9 feet ( 2.7 metres) for the rails. They were then split into radial segments using steel wedges and may have required some shaping and trimming. The ends of the rails had to be shaped to fit the posts, probably with an adze. Posts were morticed (holes cut through them ) to support the rails. This was done with a mortice axe or an auger. Fences had mainly 2 or 3 rails depending on the type of animal to be restrained. Post and rail fence at Coal Creek Heritage Village, Korumburra. Very sturdy fencing method, useful for smaller animals. Made good use of available wood. As transport improved and wire became more readily available picket/paling fences were built. These used spit timber pieces 3 inches wide, 3/4 inch thick and 3 feet ( 1 metre ) long. The pieces of timber were supported at the top and bottom by 2 strands of wire. As each picket was placed between the wires the wires were crossed to hold the picket in place vertically. This type of fence was best for small animals such as lambs, piglets and poultry. Much of the early fencing was destroyed by bush fires especially in 1898 and most would have been replaced by wire fences similar to what we have today. Fencing of some type was essential to the early farming pioneer. Without fencing they could not secure their animals. If animals wandered into the forest they may have become lost or be attacked by wild dogs. These animals were so important as a source of meat, milk, wool and leather for the pioneers own use and as a source of much needed income.